Kruk was raised in Keyser, West Virginia. He played baseball at Keyser High School, at Potomac State College, and at Allegany Community College, where Kruk played for Junior College Hall of Fame Coach Steve Bazarnic. Kruk was the first Major Leaguer to come out of Allegany and has been followed by four others (Stan Belinda, Steve Kline, Joe Beimel and Scott Seabol). Kruk's breakout year was 1987 with the Padres. He hit .313 with 20 home runs and 91 RBI, and stole 18 bases, showing surprising speed for someone of his build, although he was caught ten times. He was featured as a backup on the National League All-Star Team in the Nintendo game R.B.I. Baseball. On April 13, 1987, Marvell Wynne, Tony Gwynn, and Kruk became the first players in major league history to open their half of the 1st inning with three consecutive solo home runs in a 13-6 loss to the San Francisco Giants. 1 2 3 4 5 6 Harki, Gary. "Baseball star John Kruk one of many fooled by bank robber", The Charleston Gazette, August 5, 2008. ↑ "Jerry Crasnick: Starting 9 -- Memorable moments in Randy Johnson's career - ESPN". ESPN. 3 June 2009. Retrieved 15 May 2012. ↑ Parrillo, Ray (August 13, 2011). 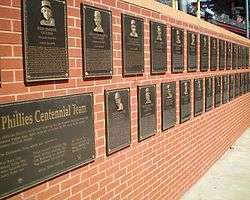 "Kruk takes his place on Wall of Fame". Philly.com. Philadelphia Media Network. Retrieved August 13, 2011.